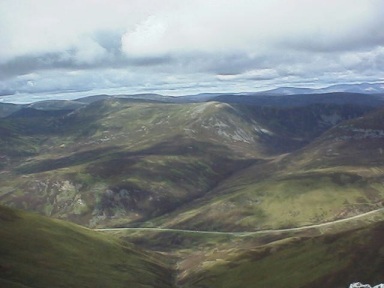 One of the easiest Munros in the land to scale must be Creag Leacach, to the south east of the popular ski resort at Glenshee. 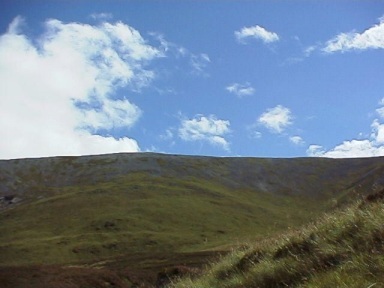 A lot of hikers climb Creag Leacach either at the start or the end of a round of Munros on the eastern side of the A93, but it can be used as a perfect leg-stretcher on its own if you are pushed for time. One of the reasons these hills are so popular is the fact that the access road is so high above sea level that a lot of the hard work is done for you. Leave your transport at the small car park near the Devil's Elbow and drop down into a small gully where a small burn has to be crossed. The path then follows another waterway at the foot of the grassy Meall Gorm. This path is badly eroded in some places and care must be taken that you do not lose your footing and slip down the bank and into the burn. Cross over the burn and begin climbing the north ridge of Meall Gorm. The going is fairly easy and you will soon arrive at its 759 metre summit. From here follow the obvious ridge towards Creag Leacach and its long flat summit ridge. The mountain top is characterised by its huge expanse of broken stone which can easily trap an ankle if you are not careful. Pass the first summit cairn at 943 metres before carrying on north east along the line of an old fence to reach the true summit at 987 metres. 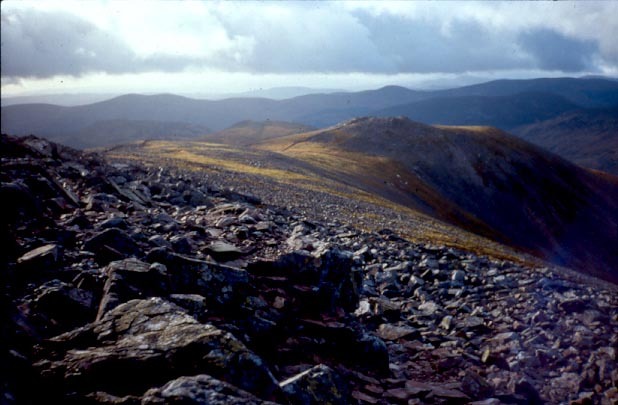 From here you can either continue on along the ridge to the neighbouring Munro, Glas Maol, or simply retrace your steps and return the way you came. Start/Parking Layby on the A93 at the base of the Devil's Elbow. Grading An easy Munro suitable for all reasonably fit walkers. At certain times the ski resort cafe will be open to provide refreshments.